Important Update: We were very saddened by the news that Paolo Becker passed on from the World of making pipes in mid-December 2014, and joins the many great pipe makers in what I hope is an afterlife that includes pipes in some way or another. Our thoughts and prayers are with his family. Our hope is that the Becker brand may continue. Meanwhile Paolo, and Fritz before him leave a wonderful body of work to be explored on the Estate market, as well as through various photographs and essays. 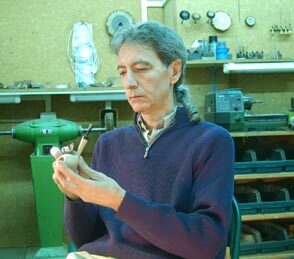 Fritz Becker, the bearer of an unusual name for an Italian pipe carver, is worthy of a story unto himself. An Austrian Jew, he fled in the late 1930s to England and served as an intelligence officer during World War II working as a linguist and translator. Following the war, he settled in Rome and lived there until his death in 1991. Becker was an accomplished painter, sculptor and designer as well as a brilliant pipe maker. In addition to his artistic pursuits, he was the Representative to the Vatican from the World Jewish Congress, an estimable position roughly equivalent to an ambassadorship. Becker and his son, Paolo, began carving pipes in the late 1970s in limited quantities from choice extra-extra quality plateau briar from Calabria, in Southern Italy. Extra-extra plateau briar is the top quality available and Calabria is considered by many to have the hardest and most durable briar in the world. Becker pipes started to gain their reputation and popularity when Fritz and Paolo Becker's work was discovered by Giorgio Musico. Musico soon realized that the father and son team that made the Becker pipe, was producing something truly special. Musico owned a major pipe shop in Rome and began selling Becker pipes. Thus, the great partnership, Fritz Becker and Giorgio Musico began, a partnership that continues today between their sons, Paolo Becker and Massimo Musico who, together, made Becker and Musico pipes. Becker & Musico pipes are currently no longer in production. Though Musico was involved in the making of the Becker & Musico pipes, Paolo Becker is responsible for every aspect of the Becker pipe. From the shaping and finishing of the bowl to the stem and silverwork, Becker pipes are made by one man. 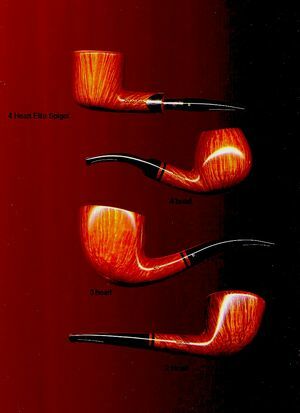 Prior to Fritz’s death in 1991, all aspects of pipe making were completed by both men. Furthermore, each Becker pipe from that era involved the skills of both father and son - no pipes were made by one or the other, so it is impossible to say ‘this is a Fritz’ or ‘this is a Paolo’ about pipes from the 1970s or 1980s. 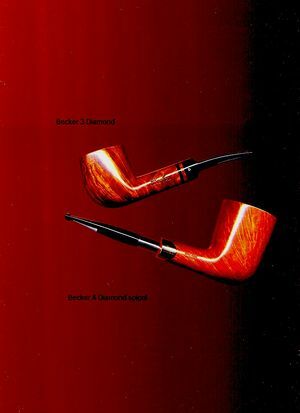 Becker pipes are difficult to categorize into a stylistic or aesthetic camp. 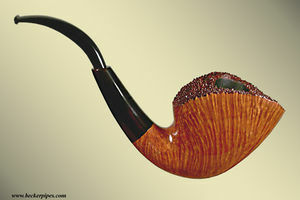 At times, his pipes reflect the traditional English styling upon which he modeled the designs for Becker & Musico pipes. The English styling can be most often seen in his sandblasts — especially his favored Bent Pot shape and his smaller Bent Apple shapes. Often, he does share the neo-classical flair of his Italian colleagues. 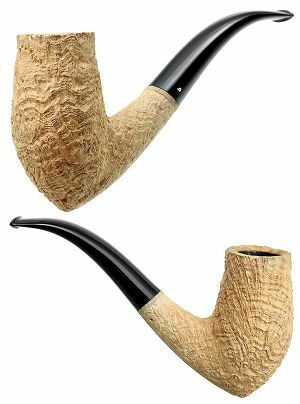 Many of his diamond-grade smooth pipes and quite a few of the Dublin and Horn themed sandblasts seem more reminiscent of Pesaro school styling. Furthermore, at times, Paolo Becker’s style seems positively Danish, with intricate, asymmetric shapes, especially in his highest grade pieces (four hearts and Royal Flush). Needless to say, Becker’s aesthetic is not easily characterized or categorized. Indeed, it is this stylistic variance that is so intriguing. Though small in production, Becker has garnered a considerable following, both in Europe and in the United States. Currently, he is producing 300-400 pipes annually, almost all of which are coming to the United States. I bought my first pipe in 1979, almost as a joke, to show the whole world that a woman could be even more beautiful with a pipe in her hand. It's a small, slender and fascinating apple. It has never let me down and the pleasure of feeling its texture and studying its grain has never abandoned me. That pipe is now over 20 years old and is still my favorite. I have grown quite curious to learn more about its origins: the creation of the Becker brand- the story of Fritz Becker who started it all and of Paolo who has developed it into what it is now. Where and when did this adventure begin? Each Becker pipe has its own history, an accurate design and exclusive creation that respects its tradition of high aesthetic and technical qualities, elements which are appreciated by smokers and collectors world-wide. And by me, too. Paolo Becker takes his time before answering. He adeptly loads his pipe and lights it with care. An effluvium of latakia spreads throughout the small workshop in a Roman street just around the corner from the Trevi Fountain and the Quirinale, the palatial residence of the Italian President. We are in the heart, in the winding alleys of old Rome, where the daily vegetable market intermingles with the shops of artisans and ancient osterias. The aroma in the workshop is unmistakable: prized briar, sawdust and that particular smell produced by freshly cut and worked wood. Answer: 1979 was a milestone, but by then Becker pipes had already made headway by leaving the attic in which they were conceived in 1970 and reaching one of Rome's oldest shops, Carmignani. At the time, they still weren't stamped with our signature (my father's or mine) but they had already gained the consideration of pipe smokers and had earned themselves a good niche on the market. In 1979, thanks to this experience and the positive feedback we received, my father and I decided to begin stamping our names on the pipes. Q: How come your father decided to start making pipes? A: An English officer introduced him to pipe smoking in 1944. However, once he had become an "experienced" smoker he was never satisfied with any of his pipes. He was constantly busy modifying them, widening bores, altering their structure and overall design. Finally, he decided to try making his own pipe. The small attic studio where he used to paint was the ideal place to begin this new experience. Q: How did you discover your talent for pipe making? A: I had always been fascinated by that attic. It was full of things, odors... It was a place in which fantasy and creativity reigned over the real world outside ... Paintings, sculptures, drawings. In 1974, I began visiting the studio more often and ended up becoming deeply involved in the new project. I had always been interested in mechanics and I loved to handle briar and experiment with new ways of working it. Q: What did your father think about this interest? A: He was enthusiastic about it. He was happy to discover that his interests became my interests. We had great fun developing new designs and improving their balance and functionality. Every time we designed a new model it was a fascinating experience that we shared. Q: How many pipes did you and your father produce at the time? A: Very few. We did it just for fun. However, as we progressed and grew more confident about what we were doing, the number of pipes began increasing, too. My father had the right idea. He began by giving them away to Carmignani clients to get feedback from expert smokers. The results were immediately very gratifying. Q: A pipe received as a gift, no matter how happy one is about it, will never really compare to one that he has looked high and low for. 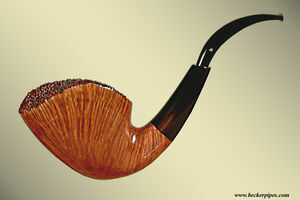 Pipe smokers and collectors rarely judge these pipes with a truly critical eye. A: That is why in 1975 we asked Carmignani to sell a series of pipes made by us that were stamped "Carmignani- Hand Made". A: And we passed with flying colors! By 1978, the pipes had earned the respect and esteem of Carmignani clients and had gained a good portion of the market. So, in 1979, the Becker brand was born and the "Carmignani" nomenclature was abandoned. Q: And the pipes left the house attic and migrated to this workshop? A: With more work space available and my full time commitment, the number of pipes began to increase so much so that we decided to expand our market to other specialized sales points in Italy. Once again, we were greeted with another success. My father always stood behind me, ready to give me advice and help, but by this time I was fully in charge of designing and carving most of the production and, in particular, the neo-classic styles that I have always liked best. Q: Becker pipes expanded rapidly on the international market, too. In particular, in the United States which has always been an important outlet for Italian handicrafts. How did you reach the American market? A: Starting in the mid Seventies, American pipe retailers had been coming to Italy and looking for pipes to market in the United States. One of these fellows, David Field, arrived at our workshop in 1981 and volunteered to become the importer of Becker Pipes. We received immediate positive feedback from America and over the years the result has been full of satisfaction and praise. David has always managed the American market and the image of Becker pipes there. Over the years, we have become very close and I now consider him a brother. 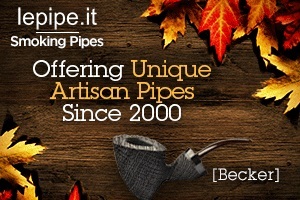 Q: Becker pipes are considered top notch both on the Italian and on the American markets. Have you had contacts with any other possible markets? A: I have, but they have been very limited. I have a few sales points in Switzerland, Austria and Germany, but there hasn't been any large scale distribution policy. Care and respect for quality has always come before quantity. A: Yes, it was turned into a shop/workshop which is quite unusual in the Italian commercial panorama. It was the idea of two pipe enthusiasts: a pipe maker and the director of an important shop. A: Giorgio Musicò was the director of Carmignani; I had by then become an established pipe maker. Together, we could provide smokers with a new and extremely satisfying type of sales point. Giorgio is one of the greatest experts in the field and has an extraordinary ability to entertain customers. I completed the scene with my knowledge on pipe making and technical aspects. Everything went smoothly right from the outset. Clients were able to learn about the history of pipes, especially English pipes which are Giorgio's true passion, and they could bring there pipes in to be repaired or altered knowing that they were leaving them in the hands of experts. A: The credit for this goes to Giorgio who wanted to provide our clients with a series of classical English pipes: English style, simple and not too big. Once again, success came swiftly and we decided to start exporting them thanks to the help of Giorgio's son, Massimo, who collaborated with me in the creation and construction of this new line of pipes. Q: And what does the future hold for us? A: The future is rooted in the past. My intention is to spend more time creating Becker pipes. 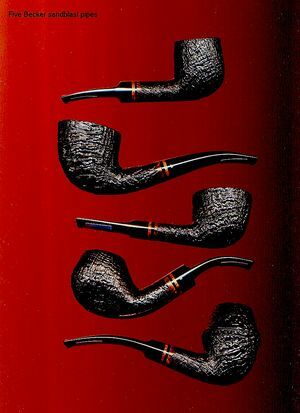 I don't mean to increase the number of pipes produced, but I want to offer a limited series re-edition of old pipes designed by my father to pipe smokers and collectors. The series will be called "My memory "and will include some of the most particular Becker designs. I decided to start this project in 1995 and since then I have been selecting the briar for it and setting it aside so that each re-edition will be made from specially seasoned briar. Q: And for your most demanding clients? A: I am going to make pipes based on an individual client's drawings and specifications. I believe it's a very positive approach, although in the past I have rarely had the time to do this. However, now that it's possible, I'm sure it will prove highly satisfying. Q: So we will soon behold a purple Becker pipe? This page was last edited on 23 May 2017, at 14:15.